In a cast-iron skillet over medium heat, cook 1/2 lb. applewood-smoked bacon until most fat is rendered and bacon is crispy but not burnt. Try a peppered bacon if you like a snappy flavor. It’s your infusion, own it baby! Add bacon drippings to a 1 quart Mason jar (or other wide-mouthed jar with a tight-sealing lid). Add a strip or two of bacon to the jar, if desired, and reserve the rest of your bacon for another use, like eating right there over the kitchen sink. 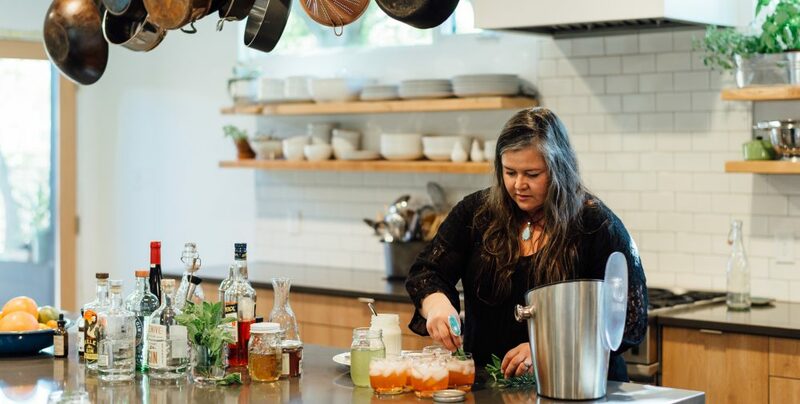 Let drippings cool to room temperature before you add your booze. I don’t recommend using Scotch or Irish Whiskey for this infusion – the flavors don’t meld well with the smokiness of the bacon and that’s a waste of good booze. 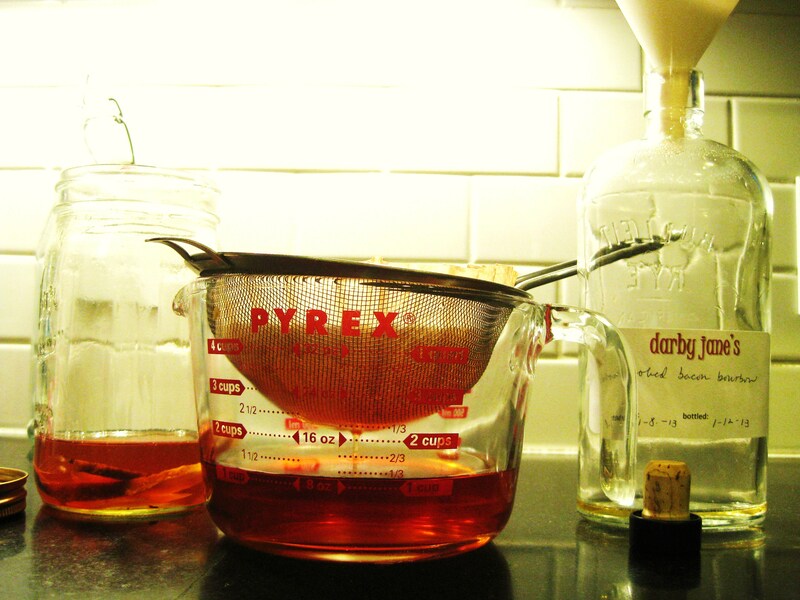 Decant into a clean quart jar or scrupulously clean recycled booze bottle. If well-filtered, this savory concoction will keep at room temperature for 6 months. In addition to making delicious toddies, smoked bacon whiskey is lovely over an ice cube or two at your next football tailgating party. Think about it: Booze. Bacon. High impact sporting events. Perfect. You’ve shoveled out the drive for the sixth time in four days, and the snow isn’t stopping any time soon. What makes this Sisyphean task bearable? Whiskey, of course. Warm, sweet, spicy, bacon-infused whiskey would be even better, now wouldn’t it? Perhaps you don’t think you want bacon in your hot toddy, but you do. You really, really do. In fact, you need a little extra protein with your booze for fortification after copious amounts of snow removal work, my friend. Forget those insipid honey-lemon concoctions you’ve slurped at overpriced ski resort bars. Embrace a beverage that warms me to my little red toenails every time, guaranteed. Savory, rich, voluptuous, and did I mention the bacony goodness? Layered with hints of cayenne, maple syrup, cinnamon, and orange, it’s almost as good as having your own mountain man on call to shovel out the city snowplow-created blockade at the end of the driveway. Especially if said mountain man looks like a young Robert Redford. Remember Jeremiah Johnson? Bacon. Redford. Bourbon. Mmmm. Redford doesn’t do it for ya? How about Jake Gyllenhaal. Better? Okay, now repeat. Mmmmm. 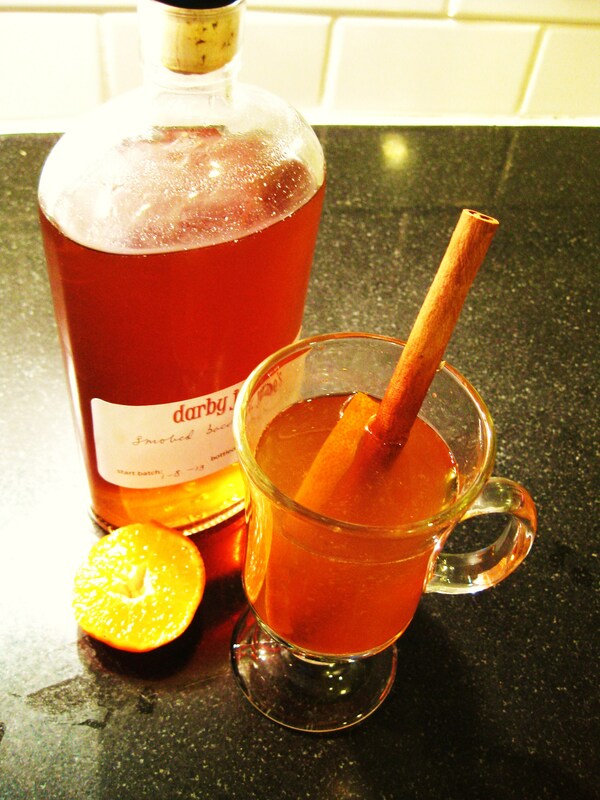 Of course, you can make this toddy using regular rye whiskey or bourbon whisky if you haven’t made your own smoked bacon bourbon yet (recipe: http://wp.me/p3807T-r). You’ve got that little jar of bacon grease in the back of the fridge – and I know you do! – so melt ¼ teaspoon or so directly into your toddy mug in the microwave for 8-9 seconds before mixing it well into the rest of your ingredients. I’m making this hot toddy for my hubby, The Macallan, tonight. My mountain man deserves some protein and sugar in his booze after digging out the compacted snowbank at the end of our driveway. I may have rammed my truck over it instead of digging the driveway out when I came back with the kids after school this afternoon. Oops. Flame an orange zest and drop it and the cinnamon stick into your mug. Now find a comfy chair, sit back, and watch the snowflakes fly.